The main reason to visit Paestum is to see three of the best preserved Greek temples in Italy, among which the oldest and best preserved of the Doric temples (550 b.C.). The site is very easy to explore, being a flat plain surrounded by fields and wildflowers. The site presents two distinct periods: the Greek city founded around 600 b.C. and the Roman city with public buildings and houses. The three Greek temples you see here today have stood for about 2,500 years. The Archaeological Museum offers the rare opportunity to see artifacts – dating from prehistoric to Greek to Roman times – at the site where they were discovered. Here, among rare Greek findings, you can admire one of the most unique discoveries of the Greek age ever made, the Tomb of the Diver, a painted tomb dating back to 480 b.C. 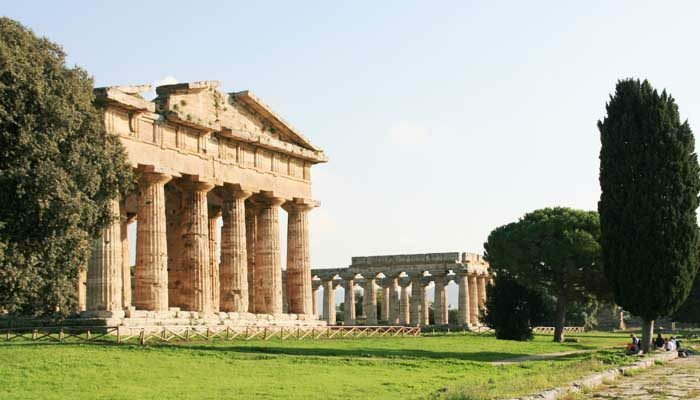 The tour in Paestum usually takes 2 hours, including the site with the Greek temples and the archaeological museum.